When Mike Huckabee spoke to a group of politically active pastors in Little Rock in December, he was asked if he is running for president again. He didn’t say no. According to a report from the statewide daily, his first response at the event, sponsored by the American Renewal Project, was that God had not yet told him if he should run. Then he said he was receiving some unexpected support and that he personally enjoyed a lot of his 2008 campaign. He’s clearly thinking about it. Let’s get this out of the way: I worked for Gov. Huckabee a long time ago as a communications aide from 1997-99. On the face of it, Huckabee’s candidacy would be an uphill battle. He left office after the 2006 elections, so “former Arkansas Gov. Mike Huckabee” is becoming “very former Arkansas Gov. Mike Huckabee.” He is a great speaker but not an enthusiastic fundraiser. There have been mediocre orators win the Oval Office, but a candidate must have money. A Huckabee candidacy would be at odds with two prevailing trends. The Republican Party is now heavily influenced by groups of very rich people opposed to government – except when they make money off it or receive special favors from it. They don’t like Huckabee because of some of his policies as governor, such as ARKids First. Outside the Republican Party, Huckabee’s religious conservatism is at odds with some of the country’s cultural changes — namely, the shift in attitudes toward acceptance of gay marriage. But those qualities might also help Huckabee find a niche — if not to win, then at least to compete in his own party’s primary. The Republican Party represents a lot of conservative evangelical Christians who aren’t always represented by the party’s candidates. No other leading Republican can speak to that audience like Huckabee can — not Sen. Ted Cruz of Texas, not Sen. Marco Rubio of Florida, not Sen. Rand Paul of Kentucky, and certainly not Gov. Chris Christie of New Jersey. Huckabee’s other brand differentiator is that he practices what President George W. Bush initially called “compassionate conservatism.” That could help him stand out in a crowded Republican Party primary where a lot of the candidates will present a different viewpoint. Some party leaders are aware the GOP has some serious message problems. It’s much better at explaining what it is against than what it is for. Its policies, explained by the wrong candidates, can come across as corporate and uncaring. The one word voters should identify with Republicans is “opportunity.” Instead, that word is often “no.” The party struggles to connect with African-American and Latino voters. Huckabee could speak to these issues, not because he’s a silver-tongued orator, but because he’s genuinely outraged by injustice and still identifies with the middle class. Politically, his faith extends beyond traditional Republican social issues such as abortion and opposition to gay marriage. You can’t fake that stuff, as Republicans should have learned in 2012. There are a sizable number of American voters who, like Huckabee, are both socially conservative and concerned about economic issues such as the widening gap between rich and poor. There probably are not enough to elect Huckabee president, and I’m not saying he should be. However, parts of his message, and the way he presents it, would be a welcome addition to the Republican presidential primary debate, which got really ugly last time and may have cost Romney the election. Republicans don’t have to nominate Huckabee or even accept his policy prescriptions, but they should learn a little from him about what to communicate, and how. For information on how to book Gov. Mike Huckabee for your next event, visit PremiereSpeakers.com/Mike_Huckabee. For information on how to book Gov. Mike Huckabee for your next event, visit PremiereSpeakers.com/Mike_Huckabee.When Mike Huckabee spoke to a group of politically active pastors in Little Rock in December, he was asked if he is running for president again. He didn’t say no. Is Gov. Mike Huckabee Eyeing a 2016 Presidential Bid? Video from USAToday.com Former Gov. Mike Huckabee tells USA TODAY's Jefferson Graham about his massive bass collection in this bonus from his #TalkingYourTech interview. For information on how to book Gov. Mike Huckabee for your next event, visitPremiereSpeakers.com/Mike_Huckabee. Governor Mike Huckabee's exclusive interview with Bono! A look at Bono's global efforts, ONE Campaign, Africa, World AIDS Day, U2 and more. 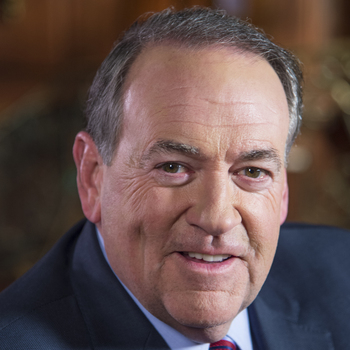 For information on how to book Mike Huckabee for your next event, visit PremiereSpeakers.com/mike_huckabee.